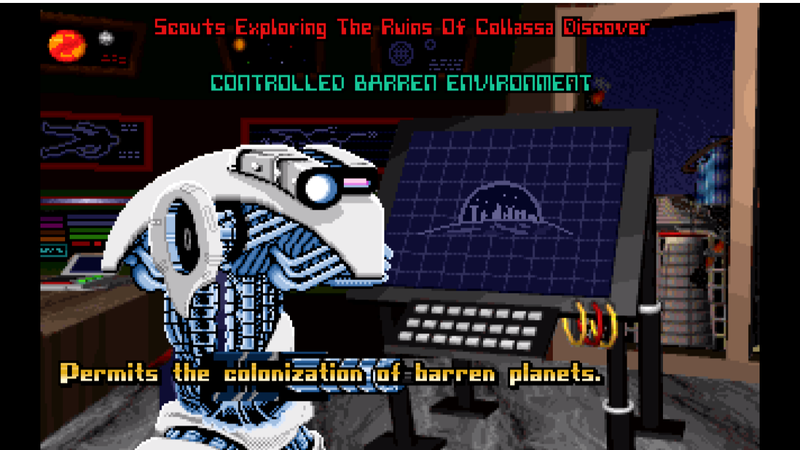 Thanks to the LBX extraction utility provided by the creator of Beyond Beyaan, I was able to get all of the various racial images in the original Master of Orion game and provide animations in Java MOO. It took most of the weekend… 10 races, 3 of the 4 graphics, 25 frames each… you get the idea. You can’t see the animations in the screenshots, but they are there. 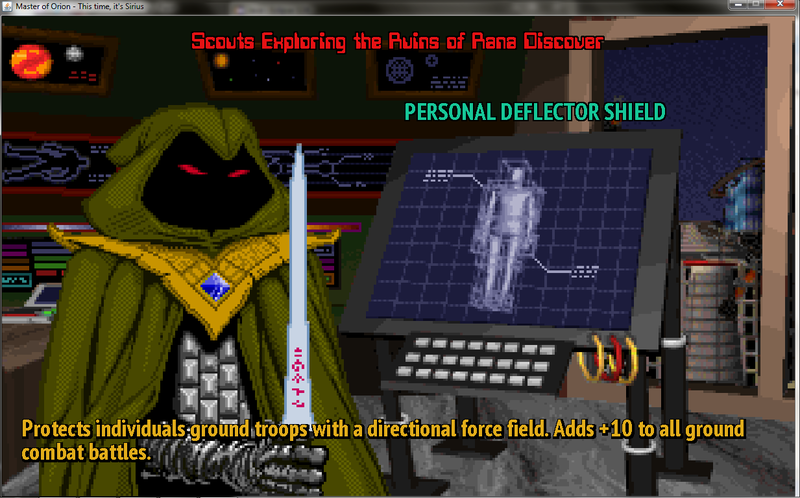 Below is the Meklar trooper, which was cleaned up a bit from the seemingly unfinished version in the original game shown afterwards (the unfinished area is concealed by the technology description). Deploying fleets is in. Basically, you can select a fleet (which can contain multiple stacks of ships), pick a subset of those ships and then send them to another system. 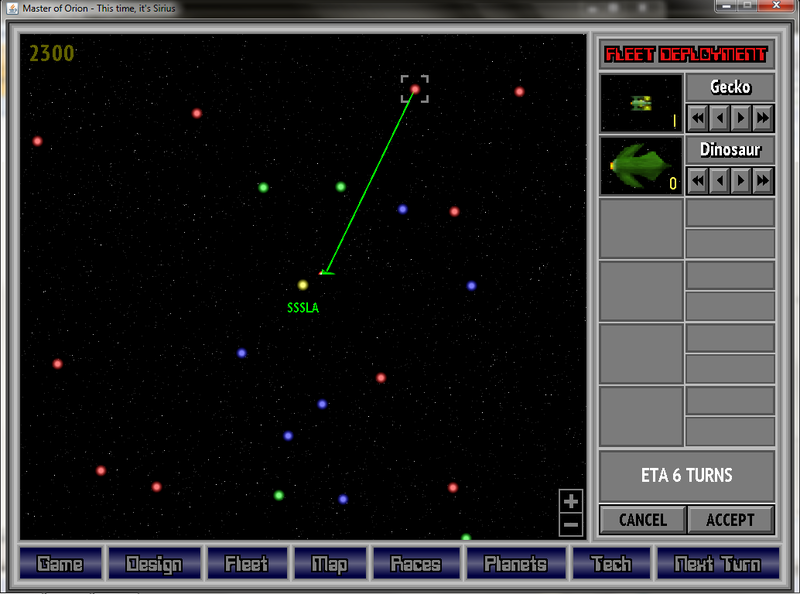 Pressing “Next Turn” will move those ships along until they arrive at their destination. I have a hit list of tiny bugs to fix and features to verify (stargates, hyperspace communication), but a player can now design, build and deploy ships across the galaxy. Colonization is not in yet, but there will need to be a bit of image scraping before that can be done. Below you can the error displayed when a ship cannot reach its destination. However, as seen below, that same destination may be reachable by a ship with reserve fuel tanks. The destination line turns green and an Estimated Time of Arrival is displayed. 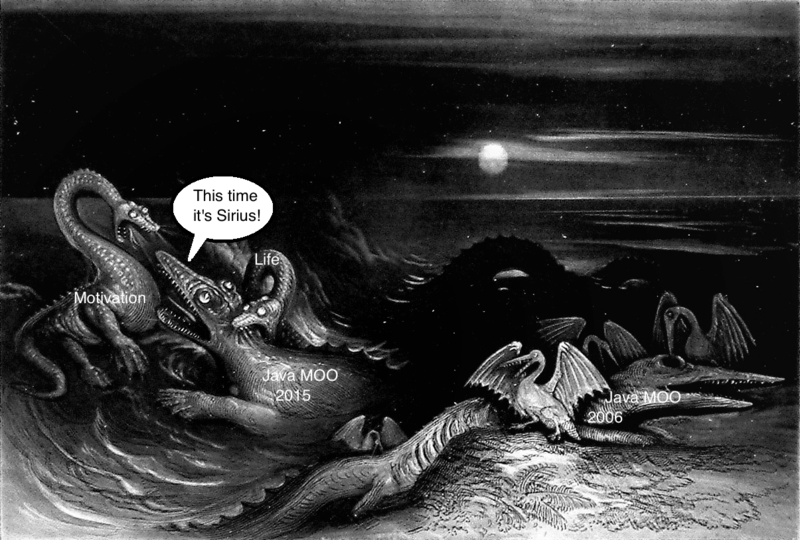 Finally, after a few presses of “Next Turn”, two of the 3 ships deployed arrive at their destination, which are immediately scanned by the ships. 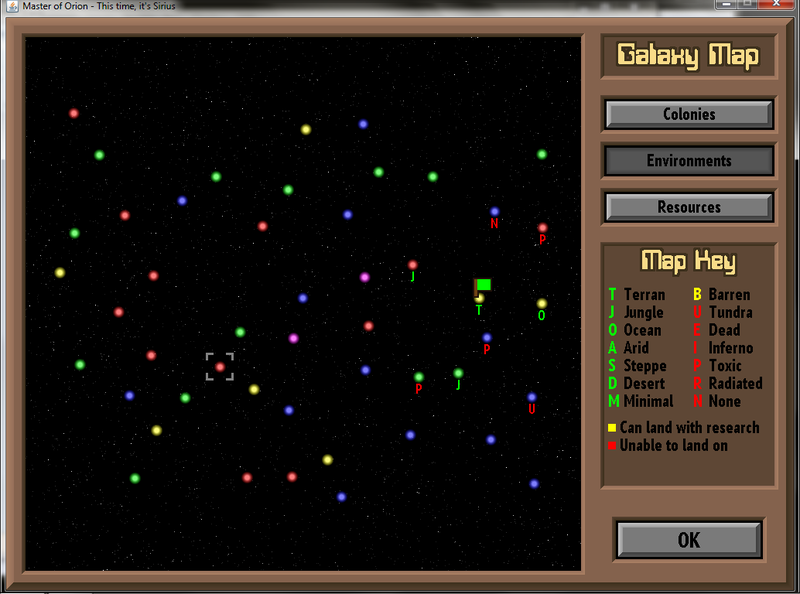 Still a few kinks to work out but, once they are done, I’m switching to the “Map” UI. 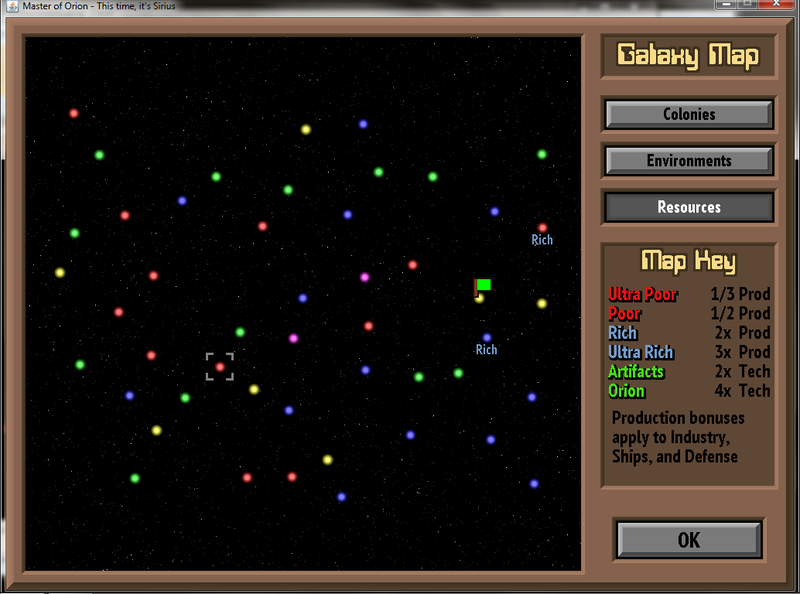 The ability to design and build customized ships in Java MOO is complete. 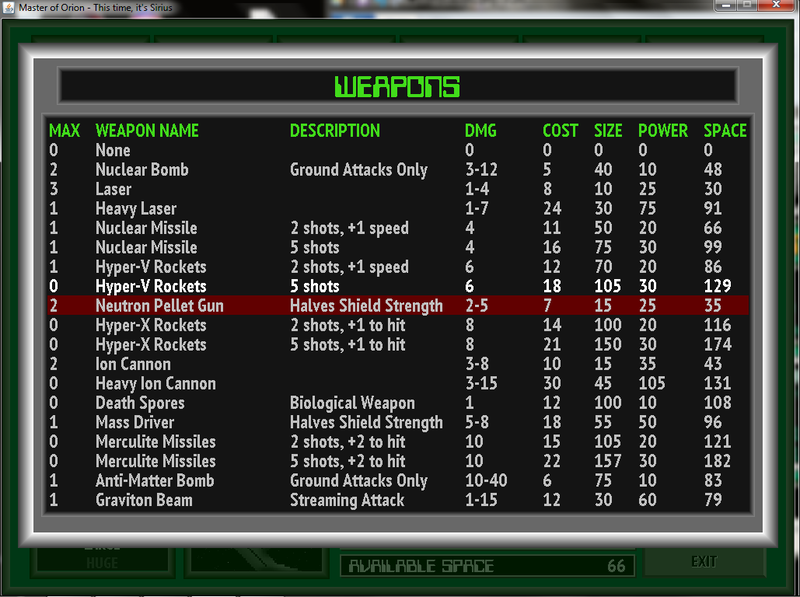 All of the options in the original game are implemented. All that is left is visual polish, which I will be working on for a few more days. The screenshot below provides a good example. 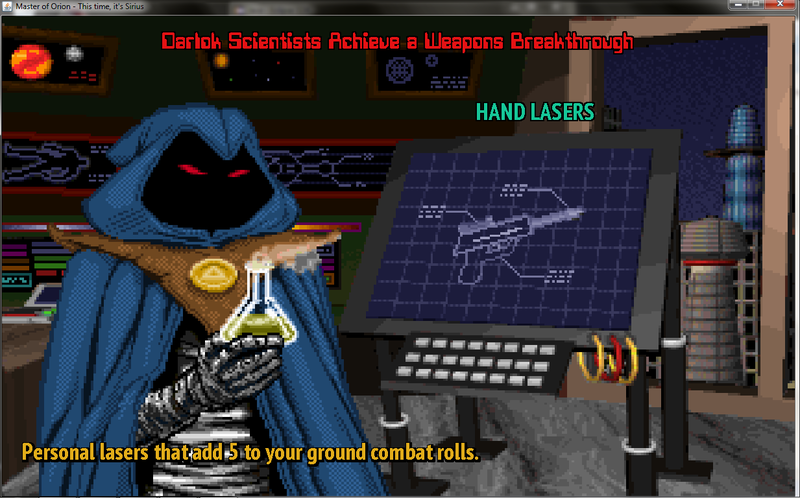 I played the Psilons for about 120 turns or so, learning a bunch of technologies. I then designed some large ship and built about 5 of them on the home colony. You can see the configuration for this ship below. I’ve settled on a greenish-tint for this UI. There are still some minor visual bugs… The Ship Icon on the bottom is oversized. The weapon damage values should be centered…. I need to verify all of the textual descriptions of the various weapons and ship specials. The specials have descriptions, but they’re not being displayed at the moment. Bad coding, obviously. 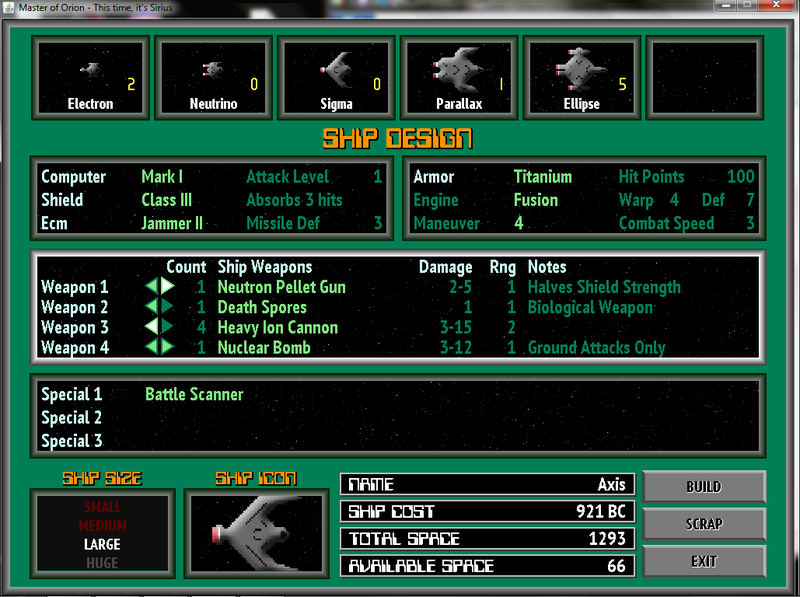 Below is the selection panel that comes up when you want to select a new ship weapon. I still need to implement scrolling for really long lists, but that’s a trivial point. Also, the numbers should be right-aligned (although they are left-aligned in the game). 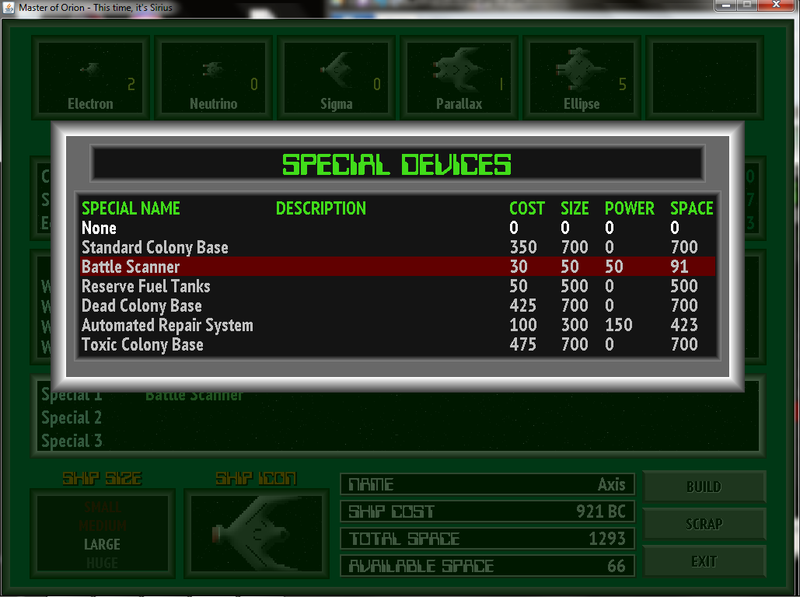 Finally, below is a screenshot of selecting Ship Specials. 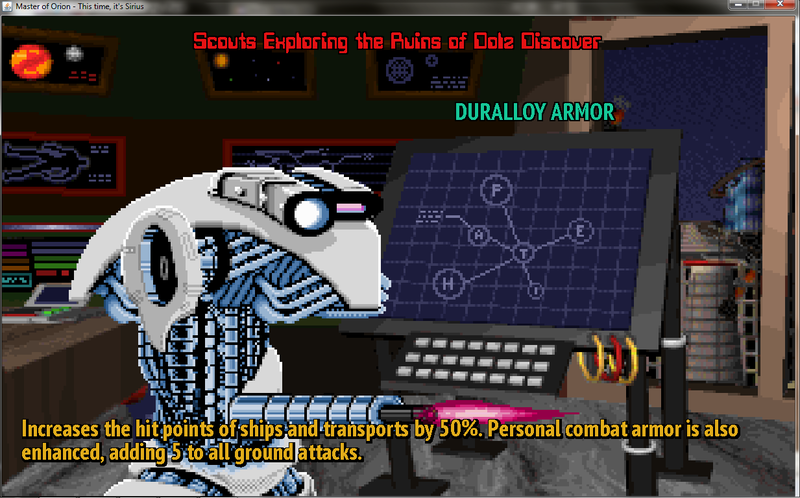 Please note that all of the other selection options (Computer, Shield, ECM, Armor, Engine and Maneuverability) are also working. You can see how I placed a green haze over the underlying UI to make it clear that you can only interact with the selection panel. I expect maybe 2-3 nights of polish on this feature and then I’ll move onto the next step of Phase 2… Sending ships out to other planets to scout and colonize. Fun stuff! I am very pleasantly surprised with my progress so far. Phase 2 work is well underway. 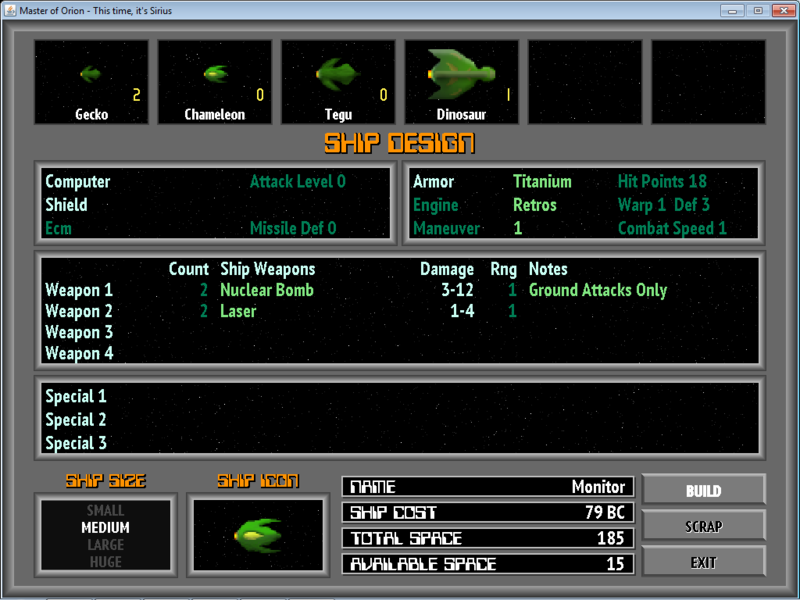 I am wrapping up “Step 3” in my earlier post, the UI for displaying and scrapping ship designs. Because of the blandness of the original UI from MOO1 and also overlap of this functionality with the Ship Design UI, I have decided to combine the two UIs into one. This not only simplifies the development but also improves the player experience since you no longer have to jump to a new screen to scrap obsolete designs. 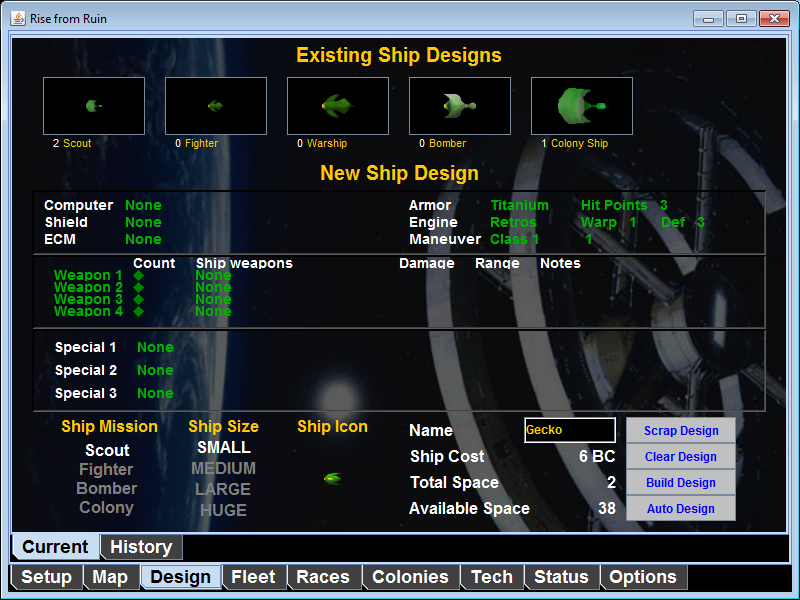 Below is an early mockup of the ship design UI. Right now, you can display, scrap or build a design… but you cannot modify one. That will come next week and requires a bit more UI work. 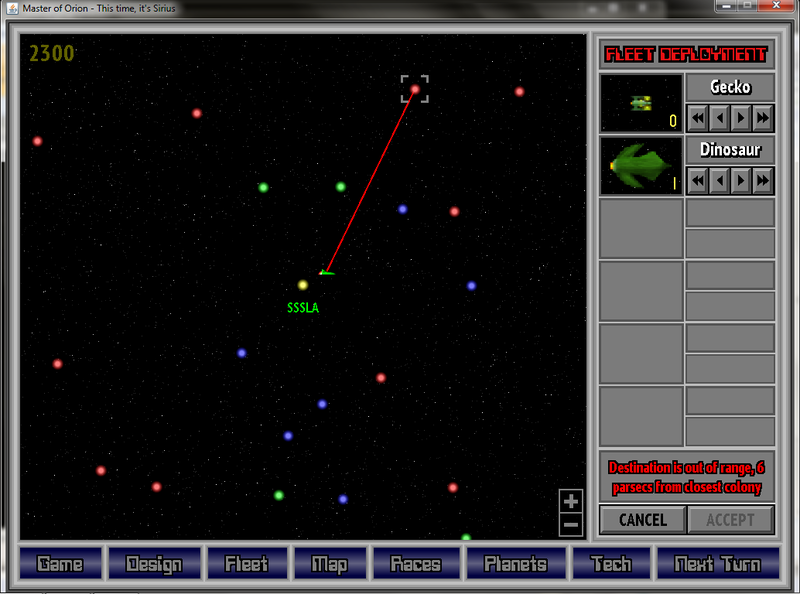 And here is a version of the game UI that I made when I was first learning Java. I think there’s a huge difference!